This page covers advantages and disadvantages of HDI (High Density Interconnection) PCB. It mentions HDI PCB advantages or benefits and HDI PCB disadvantages or drawbacks. PCB technology has been evolved constantly right from single sided, double sided to multilayer, flex, rigid-flex and so on. HDI is the short form of High Density Interconnection. HCI PCB refers to circuit board with higher wiring density per unit area. HDI PCB consists of finer spaces and lines, minor vias and capture pads, higher connection pad density etc. HDI boards are one of the fastest growing PCB technologies. These contain blind and/or buried vias and often contain micro-vias which are 0.006 or less in diameter. Moreover HDI boards consist of high circuit density compare to traditional circuit boards. HDI technology leads to space reduction, line reduction, via diameter reduction, BGA pitch reduction, pre-preg thickness reduction, board thickness reduction etc. Moreover HDI PCB supports about 4 to 24 number of layers. 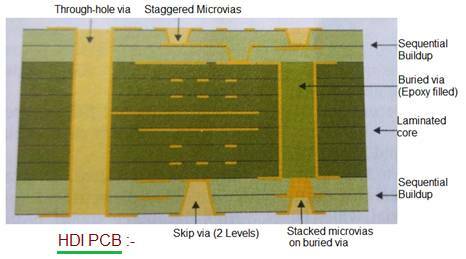 PCB thickness in the range from 0.4 to 2.8 mm are supported. Minimum track/gap of about 65/65 µm are supported. ➨It allows more components in small board areas as HDI PCBs are populated on both the sides. Hence HDI PCB offers denser trace routing. ➨It decreases power usage as a result long battery life can be achieved. ➨It offers light weight and small size PCBs. ➨Fast signal transmission with enhanced signal quality can be achieved using HDI PCB. ➨It offers space to mount more components compare to traditional PCB. ➨Technologies are at evolving state. ➨There are different ways to achieve similar technology (copper, filling, drilling). ➨Limitations of HDI PCB are linked to reliability of plated holes. Limitations of blind via is aspect ratio. Aspect ratio refers to division of material thickness by hole PTH diameter. ➨The main problem is plating process. To assume good hole plating integrity, aspect ratio is limited to 1:0.8 for blind vias, where as advanced value is 1:1. Due to aspect ratio limitation, PCB manufacturers select special pre-pregs i.e. very thin, with appropriate reaction to laser drilling. ➨HDI multilayers must be built up with appropriate materials. ➨Standard pre-pregs contain fiber glass which is huge for laser drilling. Moreover glass contained in the pre-pregs changes laser direction and creates mediocre or wrong shape quality of laser via holes. ➨Via holes are sensitives. Vias are similar to rivets which are used during assembly process. ROHS applies high thermal stress on vias. Expansion of material in z-axis stresses the vias. The trend is to continuously reduce via diameter and increase the reliability.